On track for a $40/yr garbage "bill"
Last year, I did some math on our trash service and realized we were paying $222/yr for trash service - which wasn't very good service, in that I had to haul a can uphill 1/8 mile each week to have them, maybe, come pick it up. Pickup wasn't terribly reliable for some reason, and hauling a heavy can, with small wheels, up a good gravel driveway slope just wasn't fun. So I built a trash trailer. 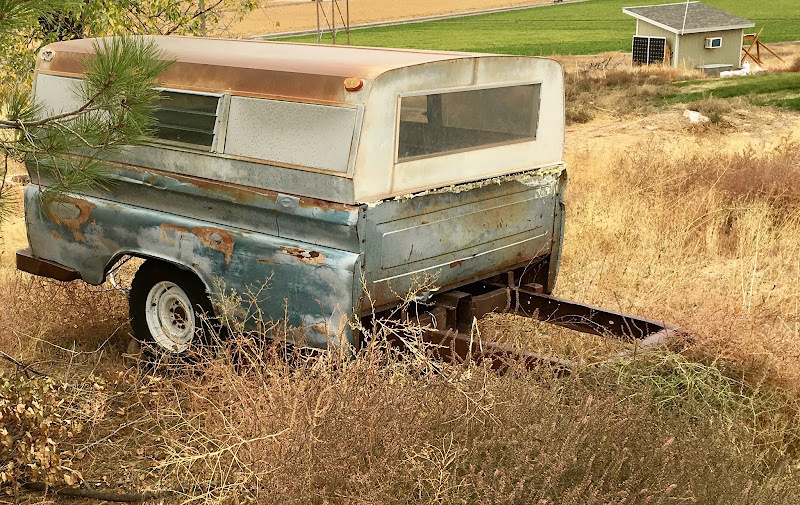 https://syonyk.blogspot.com/2017/10/building-trash-hauler-from-old-parts.html It's a 1964 pickup bed trailer with a 1973 topper on it, free from a relative who lives nearby - he wasn't using them, and I had a use. About $200 in tires, plywood, and urethane to protect things, plus some bolts and a can of foam. This has been working wonderfully. 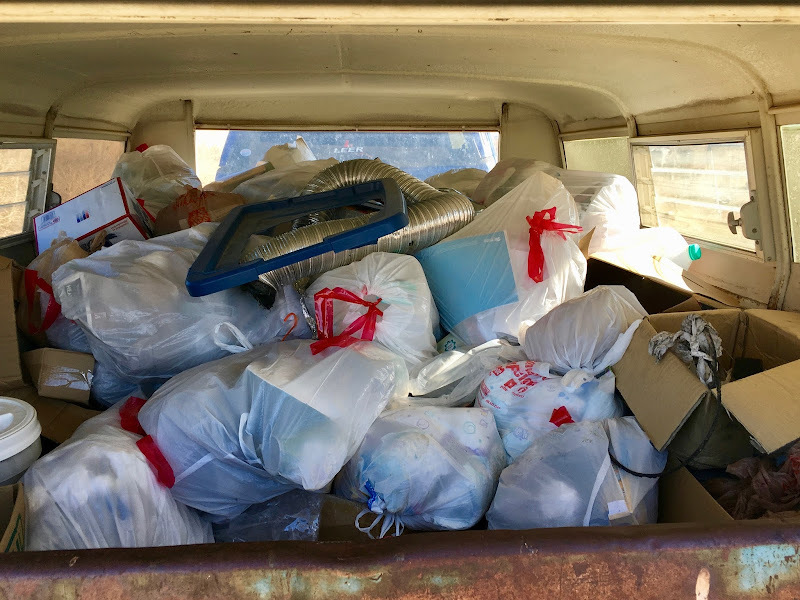 I hauled the first load after 3 months, not because the trailer was full, but because I had some other stuff to haul (banquet trash, which... I'm not sure why I volunteered for that, but I had a trashed couch to haul too). Current trends are that we have to haul trash about once every 4 months, plus or minus a bit (I may be able to stretch it to 6 months, but it's likely in the 3-5 range most of the time). Hauling trash to the dump is a 26 mile round trip, or about 2 gallons of diesel. Since the weight of a full load is under the minimum (annoyingly), it's $5 to unload, plus the fuel for the round trip (about $7.50), and a tiny bit of truck maintenance (mostly time based, since I don't drive it much). Or, for three trips, $37.50/yr. It's more convenient than hauling trash every week, we buffer our trash, and I've diverted a lot out of our waste stream already. I'm looking into compressing the stuff more before tossing it in the trailer to extend the trip time out, but this project, so far, is a big win! Saving $180/yr, and having a better quality of life in the process! Re: On track for a $40/yr garbage "bill"
Haha! I love it! We live on 4.5 acres and I could see my husband totally doing this to save money! My sister-in-law lives on 3.5 acres next door and she pays us 1/2 of the trash bill and puts her small amount of trash with ours, so we only pay 1/2 for the garbage bill. Been doing that for 20 years! At our cottage, we don't have trash service because we haul it home with us. Now if I could just lower our sewer bill at our cottage. We have a well, but they put in sewers a few years ago and everyone is charged the same amount no matter how much you do or don't use it! Haha! I love it! We live on 4.5 acres and I could see my husband totally doing this to save money! It's not a huge savings, but it's a very real quality of life improvement compared to hauling a big garbage can with tiny wheels up a 1/8 mile hill of road mix every week! And then hauling it back down. Actually, I usually just left it at the top until I had my truck, and then tossed it in the back... or hooked it on the hitch. There's a bit of an art to getting down the driveway with a garbage can hanging loosely on the hitch, but I'd gotten decent at it. This is also a very real way to keep an eye on our trash production. I see it when I'm tossing trash in, and see it when I'm pulling it out. Some of it is reasonable, some of it... eh. I've been diverting cardboard out for use in sheet mulching and other garden-ish projects, and that's helped a lot. An awful lot of our trash volume was cardboard, but it's building in one of our sheds now (flattened). How does it work in the summer when you've got a bunch of trash-bags baking in a tin can for several weeks? Does the trash ever turn into rotting goop? Also - trailer registration costs? Also also - why are those PVs in hte photo not out harvesting electricity for your office-shed? I'd worry about critters getting into a trash pile, but that's just me. Great job saving a few bucks though! Waste bills are the worst! I would probably have figured out a way to install a composting toilet (from either ACS or Clivus Multrum) and grey water system rather than repairing the sewer line if there were a way to opt out of the sewer bill (my state requires grey water systems have the option to switch to sewer and prohibits kitchen sinks on grey water systems). My trash pickup is the smallest service allowed and is regularly less than 25% full on pick-up day. Combined these bills are over $160 every other month (about 75% wastewater/25% solid waste). Glad you have a quality of life improvement, but I would have just held the trash company to account and made it easier to haul the 1/8 mile (say a home made hitch mounted platform). I'd rather do that than deal with the problems above =) Sadly, it would cost about $25 to unload a trailer like that where we live so it wouldn't even be a cost savings (though oddly, if it were a truck bed still attached to the truck, it would be only $9 hah). We're pretty careful about what goes into the trash, so there's not much in the way of food waste. It'll smell a bit in the summer, but there isn't really anything that can rot in it. That stuff goes into the compost bin. It's almost entirely dry waste, with the occasional disposable diaper, but those are just for overnight, so they're rarely messy. Idaho has permanent trailer registration - pay once, you're good forever, and this already had a plate. My inlaws have outdoor trash storage in burn barrels that aren't exactly well sealed at the bottom after a few years of burning and sitting, and they don't have a problem, so I'm assuming that with nothing much to eat in there, they're not going to bother it. There are far tastier places on the property than a trash trailer without food in it. It's in a decently shaded area, and I've since tossed some scrap OSB up against the tires to shield them. We don't get much in the way of rust here. The trailer doesn't roll many miles a year, and a round trip isn't that far (30 miles). So I'm just not that concerned about it. Worst case I transfer the trash into my truck bed and haul it while I fix the trailer, but if I need another axle or something, old truck axles are a dime a dozen out here. If there's no food in the trash stream, what is there to rot and stink, really? Our trash can we had previously stunk an awful lot more than this does, because we weren't as careful about what went into it. My initial attempt involved dragging it behind an ebike, and I destroyed a perfectly good frame that way. Starting the truck to haul a trash can to the top of the driveway is silly as well - I try not to short start it that often. We went from $160 yr for pickup to $0 for drop off (not including the taxes we pay) when I retired. We were taking recycling anyway (no pickup offered) and we can fit nearly a month's worth in the trunk of our car for drop off. We have a no food in the trash rule (the chickens get most food scraps) so odor/pests are not much of an issue. Most of the time the trash run can be coupled with other errands, so the additional fuel and wear are negligible. Nice! There's not much out towards the landfill but a shooting range, so it's not a direction I go regularly, but it sounds like you're doing something similar. Free drop off? Jealous! Eventually I plan to have some worm bins and chickens to deal with food scraps. One project at a time, though. Like you I have a $0 trash system. Where I live maybe 90% of the county is forced to have county trash pickup paid as an extra fee on the property tax bill. The area where I live you don't have that - instead you have to pay for private pick up. I was paying $35 / mo. yet had very very little trash which really irritated me. So back in 2007 I decided to cut it off entirely. Like you I compost, recycle, donate, resell, etc... and don't put any food wastes in the trash. This leaves me with almost no trash. Recycling is right on the way to work, and my daily trash can be compacted into the size of a softball which I throw in one of the trash cans on my way from the parking lot to my office. I wanted to make sure to keep this up, so I made myself an incentive. I started investing my saved trash fees into a DRIP program back in 2007 and will keep it up as long as I don't pay for trash service. So far I am up to about $7,000 in the stock, and the last dividend (in March) was $48. Here you must pay for trash whether you use it or not. We had to pay for months when our house was empty. In our previous home we paid $78 every two months for trash/recycle pick up. $468 per year. When we moved I almost went back into that cycle. Instead I realized there were county transfer stations. You pre-pay for the county bags. Recycling is free. We started composting. Now between two people we have maybe a bag per week. I buy the larger county bags which are cheaper per gallon and cram them as full as I can. I know we should probably be producing less trash, that’s a work in progress. Once year I buy around $70 in county bags and it is plenty. The transfer station is right outside of town so I try to combine trips with other errands. When were were renovating a rental property we bought I was going to rent a large dumpster but our contractor told me about a dump with a scale that just weighs the pick up before and after drop off. 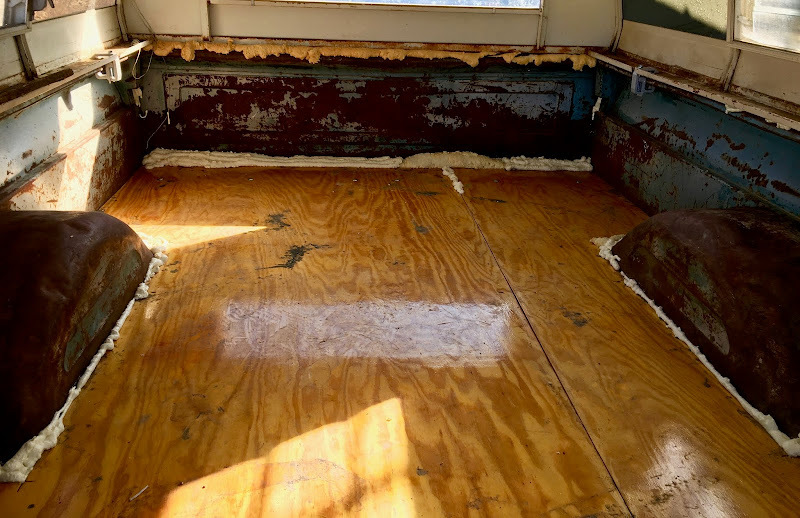 To renovate the 900 square foot house I had four pickup truck trips of junk. Each were around $15-20. So less than $80 overall. Given I’ve always been an office worker, I was proud of the sweat equity I put into the rental. Once year I buy around $70 in county bags and it is plenty. Nice! $400/yr is a good chunk of change to save for thinking about trash a bit! ...a dump with a scale that just weighs the pick up before and after drop off. Excuse my newness. I didn’t even know about the weighing thing. I grew up in suburbia that had town junk pick up weeks. So this luxury was new to me! Huh. Yeah, all I've ever seen for dumps and transfer stations ($$$ ouch) are weight based. Usually with some minimum. I'm annoyed if I don't hit the minimum weight on a dump run (you pay the same if it's 1lb or 500lb, up to... I think 600lb is the base fee), but my trailer tends to run light and not make minimum. How far under do you tend to run? Still working out averages, but I think a trailer load is about 400lb, against the minimum of 600lb. The minimum charge is only $5, so it's not like it's costing me more than a few pennies, but I just like to optimize my loads to the dump. I can always see if my neighbors have anything that needs hauling when I go for a couple bucks (I can toss it in the truck bed before I hook up the trailer). I hauled a full trailer today, 360lb. I need to work on increasing the density of trash in there - I noticed that there were a lot of empty milk jugs and the like that hadn't been squashed down. Plus a lot of the trash bags aren't really packed that well. I'm going to work on that, because if I can improve density by 50%, I can get up to the minimum weight, and add another 2-3 months as well. This time was almost exactly 4 months, but there was a lot of ferret room debris in there from when we tore the old one apart and created a new area for them. So, I think 6 months is doable with some compression. I'd like to find a use for paper waste. I'm half thinking about building compressed logs out of them, but I'd have to use them in campfires and such, as I don't (yet) have a wood burner. Update for those who were wondering about critters: Yes, there are most definitely some mice living in there. We have mice in everything this year - it's a really, really good year for mice, annoyingly. I've had to chase them out of one of my storage deck boxes as well. I've got a few sticky boards in there now (I don't want to poison them because we have a property cat we rather like), and after I haul the trailer next time (Sept-Nov timeframe), I'll go through with a can of expanding foam and tighten up some other entry points. I have some ideas of where they're getting in, based on where stuff isn't fully sealed up. I wasn't sure that they'd be able to climb the metal frame, but apparently they can. Not a big deal, will iterate on it and come up with something that works. I hauled a full trailer today, 360lb. I need to work on increasing the density of trash in there - I noticed that there were a lot of empty milk jugs and the like that hadn't been squashed down. Do you not have recycling available? Milk jugs shouldn't be going to a landfill. I don't have anything resembling meaningful recycling available, no. The one trash company that covered our area and had a recycling bin no longer covers us, so recycling is "I haul stuff to wherever I can find to take it." And, at some fairly low bar, it's not worth separating out every waste stream to drive somewhere to pay them to take it, since the places that take various materials are not all at the same place. If I want to recycle glass, for instance, the nearest place that takes it is about 40 miles in a direction I rarely go. We don't recycle glass, though I've considered finding some uses for it around the property (haven't found a use yet, since I don't have a way to crush it into powder). I currently separate out aluminum and steel, and the last box (about 18" cube) of crushed aluminum (10lb) got me a whopping $4. It literally doesn't even cover gas if I make a separate trip for it. Steel... probably far worse, though maybe going up in the moderate future. If you've got a good solution for recycling plastic in the Boise/Nampa Idaho area that doesn't require me driving an awful lot to haul it, I'm open to suggestions, but I just haven't found much yet. So, it goes to the landfill in small quantities. I'm hauling this trailer every 4 months or so right now, aiming to get it down to every 6 months or longer as I divert more out and possibly build a compactor. Some scrap iron and screw jacks would reduce volume by a ton. Maybe you could try to drown them. My parents dug buckets of water in strategic locations and the mices got cought in the water and could not get out. That's my plan - I'm going to build some 5 gallon bucket mouse traps here soon and put them around to help trap some of this year's surplus of mice. Well, got 6 months, 460lb, wasn't totally full, and found somewhere that does take multiple classes of recycling and is more or less an area I go on occasion (sort of near Home Depot/Lowes). An evaluation of Christmas trash coming plus the fact that winter is about to hit suggested I might want to haul it before it got too nasty out. Though the landfill dirt was bone dry and sandy, which is never fun (also, why I leave my front hubs locked in). I've foamed the likely entry holes for mice, under the theory that, while they chew the foam if they're inside, they probably won't chew their way in. I'll see if it works. I assume I relocated quite a few from the property to the landfill today, which is just fine with me. - Crushing aluminum and tin cans (as possible) really helps reduce volume in the recycling boxes, and the tin cans being pulled out this last cycle helped reduce trash volume. - Flat-stacking paper waste from junk mail is better than crumpling it and tossing it in the trash. It can be recycled, and takes far less space that way. Downside: Our kid constantly finds stuff in the paper recycling box that she didn't want thrown out. 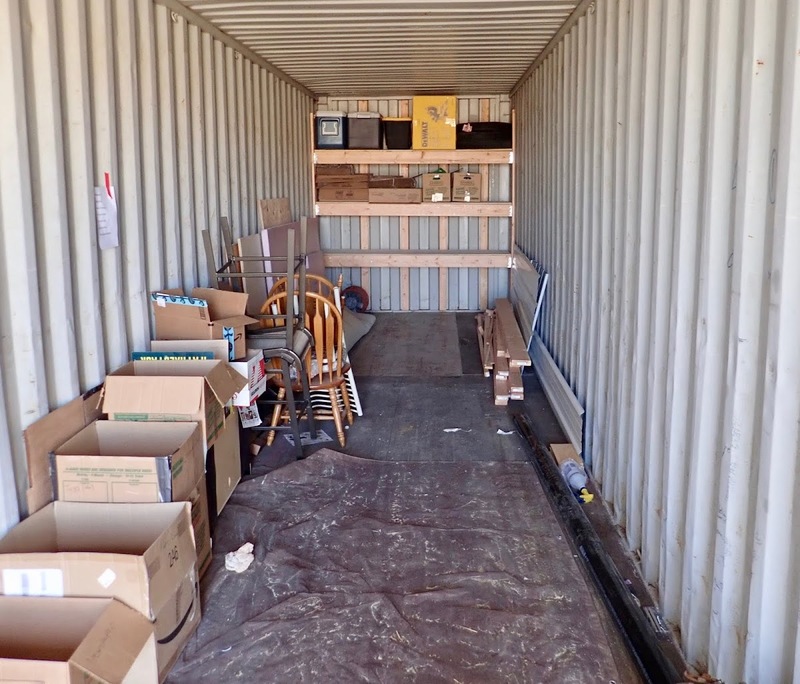 The plan for the next cycle is more boxes out in the shipping container, with a local staging box in the house so I can haul the recycling out and crush/sort it every few days. I think this will pull a good bit more volume out of the trash trailer, and by moving the recycling boxes out of the trailer, I free up a surprising amount of volume in there that I can use for trash. My goal for the next cycle is a year. With the diversion of more recyclables out, and the increased room, plus our general working to reduce waste, it should be possible. Once I get the greenhouses in, I'll probably put a rocket mass heater in that will let me burn a good bit of our waste stream as well - or, at least, that's the hope. Save up the paper and such for winter, when I need to put a touch of heat in the greenhouse. Still following. A lot to be learned by examining our waste stream. Is a bit different when a truck doesn't magically pick it up every Turesday! I found burning paper to be a drag. To get it to burn well, it needs to be crumpled, but then it burns too fast. I use just a little to light the woodstove. Now, cardboard, seems to burn much better and actually contain some heat. I use it in fairly large quantities as "kindling". A big enough charge of cardboard will light logs with no trouble. Is there a place to sell aluminum and or steel close by? It's not worth much, but we sort it out and make a trip to the scrapyard every 6 months or so. I usually get $40-50. A lot of plastic "recycling" doesn't actually get recycled. It's likely to end up in landfill either way (at least in the USA). Syonyk, nice trash trailer! ; ) We're rural as well and service costs are something I've thought quite a lot about over the years. I've got us down to a monthly internet and electric bill (10kw PV offsets most of that in the summer). Fortunately for us, we have recycling drop-off available only 15 minutes away. Scrap metal I like to haul by the truck full..accepted for free, and not much value in scrap at the moment. Food waste goes to feed the wild critters. Cardboard and junk mail goes in the burn barrel. One thought to improve your efficiency might be to pick up an old trash compactor, the kind that was popular in the 1970's and 80's. These fell out of fashion when people realized compacted rotting trash in their kitchen wasn't exactly an aromatic delight, and I've seen many scrapped or donated to Habitat stores, still perfectly functional because nobody wants 'em. Tougher to find now, but they're still out there. BTW, the mouse trap bucket is the only 100% effective method I've yet to find. Pads are second best, but the damn things get away if not checked within hours, and the pads end up 5' away from where they were placed, usually in some unreachable spot. There is, but we don't generate much scrap metal, and it's worth a couple bucks, at best. It's literally not worth the fuel to haul it unless I'm taking it along with other stuff. I got a whopping $2 for cans yesterday. We don't drink that much soda. Nice, we'll have solar next year. That's the next huge project I'm starting, and it's going to be a big one - about 18kW of battery-backed array, with quite a bit east-west facing to optimize self consumption and reduce grid export/import. The well pump draws a good bit during the summer, and we get cold in the winter. One thought to improve your efficiency might be to pick up an old trash compactor, the kind that was popular in the 1970's and 80's. I've thought about it, but I thought most of them required special bags to be of any use - which defeats the purpose. If I could squash down stuff in plastic bags without destroying the bags, I'd certainly consider it. I've thought about building my own to mash stuff down - get a surplus wine press or something. BTW, the mouse trap bucket is the only 100% effective method I've yet to find. Good to know. I didn't end up getting those built this year, but I'll try them next year. Where I live, recycling pick-up is "free". Most garbage goes down our garbage disposal. The rest of the trash I collect in a small plastic grocery bag which I deposit in a trash can when I get gas etc. every couple of days. Using gas station garbage cans...now there is something I hadn't thought of. Lol, my husband works for the water district. We don't get to use our garbage disposal at all. Everything goes into the compost bin, which is part of our flat-rate bill. Nice work so far. How about eliminating use of cans, crushing glass first, buying milk in cardboard cartons, and burning all the paper products in a barrel? What else is left? Working on it. Cans are still useful for various things, both aluminum and tin, but those are all recycled. I'm not terribly interested in setting up a burn barrel yet - at some point, I may consider that once I have the time to build a rocket mass burner. That will likely be tied with a greenhouse, and will make very efficient use of waste paper/scrap/etc to heat things (including some water tanks for fish). But a burn barrel does tend to annoy some neighbors, so until I have a way to burn properly clean, I'm not going to mess with it. Most of the remaining trash is things like styrofoam from packaging materials (I haven't found a way to recycle that yet), plastic produce bags (at some point, I'll probably build some reusable ones), kleenex (burnable once I get that infrastructure in place), and a small stream of disposable diapers - we mostly cloth diaper, but not 100% (overnight diapers are still disposable for capacity reasons). At this point, I'm pretty sure I can manage a year on the trash trailer, with how much has been diverted out to recycling. Uh, open burning is not without problems. I mean, I wouldn't do it during the peak of summer out here, but it's common enough. I just don't want to be emitting much particulate smoke if I am burning, which implies a rocket mass burner with sufficient exhaust length for proper combustion of everything. I've never heard of someone fueling a rocket stove with paper goods, but I suppose you could roll it up to make fairly dense sticks. My understanding is that the efficiency of the combustion is primarily due to the high temperature within the insulated heat riser (also the mixing of the gasses due to the sharp turn). Exhaust length is primarily about extracting the heat. I've considered making "paper bricks" out of shredded junk mail once I have a proper system to burn them. And, yes, you're correct about where the combustion takes place, but I still don't have a reason to build a rocket mass device just to dispose of trash. If I'm making the trip every year (which I now think is doable), I'm spending about $10/yr (and about an hour and a half, total) in trash hauling costs (recycling is ~free as I haul it when I'd otherwise make a trip), so I've optimized things down to the point where it doesn't matter - the materials cost for a burner exceeds the savings, dramatically, unless I need the burner for something else. Since reading this thread, I've noticed people take a medium-sized garbage sack from their car and dump it in the trash cans in store parking lots (they remove the top lid to get their gabage bag inside in trash can). Probably would be fined if caught; their risk for a $0 garbage bill. I'll throw trash from my car in a gas station trash can every now and then, but I'm not (personally) OK with hauling my trash and tossing it in a school dumpster, or store dumpster, or (whatever). I want to deal with it properly, not freeload on someone else and hope I don't get caught. At some point, I might organize it a bit more and build a rack for more standard size boxes, but it's working well for now.